Every day, the body is exposed to several harmful chemicals, which introduces dirt and other impurities in the body. This eventually causes blackheads, acne, psoriasis and other skin disorders. Activated charcoal is known to help absorb impurities from the body, and it works as a magnet, as it helps trap toxins and other harmful chemicals in the body. It also absorbs excess oil and balances the skin oil. Although the benefit of activated charcoal is mostly known on the skin, it also benefits other parts of the body, including hair and the teeth. It still works in the same manner, by binding to toxins, taking them out and opening pores. This will make your skin glow, your hair healthier, and your teeth whiter. Activated charcoal is very absorbent, and when used on the skin, it pulls out impurities and heavy metals. It is also perfect for areas that are prone to oil and clogged pores, as it helps open up pores. You can mix a little water or organic rose water with activated charcoal to form a paste, and then rub on your skin. Activated charcoal, when used on the teeth, binds to many organic substances that might have stained the teeth, making your teeth appear whiter. It also scrubs off plaques and tartar from the teeth, which reduces the risks of bacteria that could eventually form cavities in your teeth. There are many toothpaste brands today that make use of activated charcoal. You could also use half a capsule of activated charcoal with a little bit of water, to brush your teeth. Rinse your mouth afterward, and see how whiter it just got! It is recommended to brush with activated charcoal once in a week and continue with your regular toothpaste on other days. Who doesn’t want a long, full and silky hair with clean strands? Activated charcoal will help absorb impurities in your hair and make it clean. It helps relieve dandruff, redness, oily and itchy scalps and can also be used as a scalp treatment. You can add the activated charcoal to your shampoo, for easy application, or consider buying a charcoal shampoo. It not only makes your scalp cleaner and healthier, but also encourages faster and stronger hair growth. 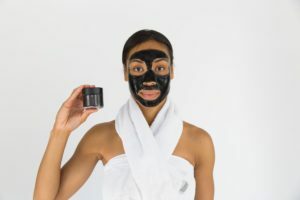 While activated charcoal on the skin tends to get a lot of applause for its effect on just the face, it is imperative also not to ignore its effect on other skin areas. It also helps exfoliate the skin with its gritty texture. In addition to charcoal face masks are other charcoal products for the skin, including face and hand soaps. These products work effectively to cleanse, trap toxins and also help balance excess oils, thereby leaving you to healthier and glowing skin. Detoxification is one of the major functions of activated charcoal, and it has functioned as a detoxifier for centuries now. An activated charcoal face mask can help detoxify the skin, and reduce clogged pores, puffy eyes, skin dullness, and breakouts. It can also be added to drinks, as it helps bind toxins in the system, thereby reducing the risk of harmful or poisonous substances in your system. Some charcoal products are sold that you can easily apply on your skin to help with the detoxification process. You can also mix a capsule with enough water and then add apple cider vinegar and lemon essential oil. Make the mixture into a paste and then apply on your face. Rinse with warm water and apply moisturizer afterward for better effect. About the author: Erika Jensen is a beauty blogger, and a vegan. She is very passionate about natural skincare, and mindful living. As an avid blogger on various blogs and publisher on various websites, she enjoys writing about topics in health and fitness.